In Nintendo's Pokémon X and Pokémon Y 3DS games a new feature is introduced called Pokémon-Amie in which you can feed your pokémon sweet treats called poké puffs. These desserts increase the affection of your pokémon and come in several flavors and levels, like mint, citrus, frosted, fancy, etc. There are even special poké puffs, four of which are based on the seasons. These treats could be translated into cupcakes or even sweet buns (which I actually might do at some point), but because they are called poké puffs I decided to make mine into light and fluffy cream puffs. 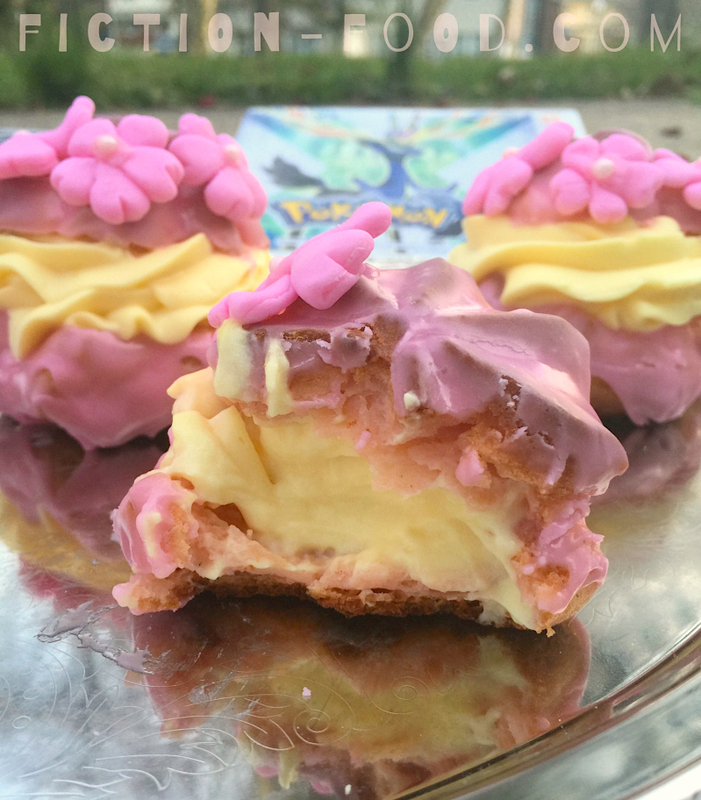 So, I suppose that makes them poké puff inspired cream puffs. 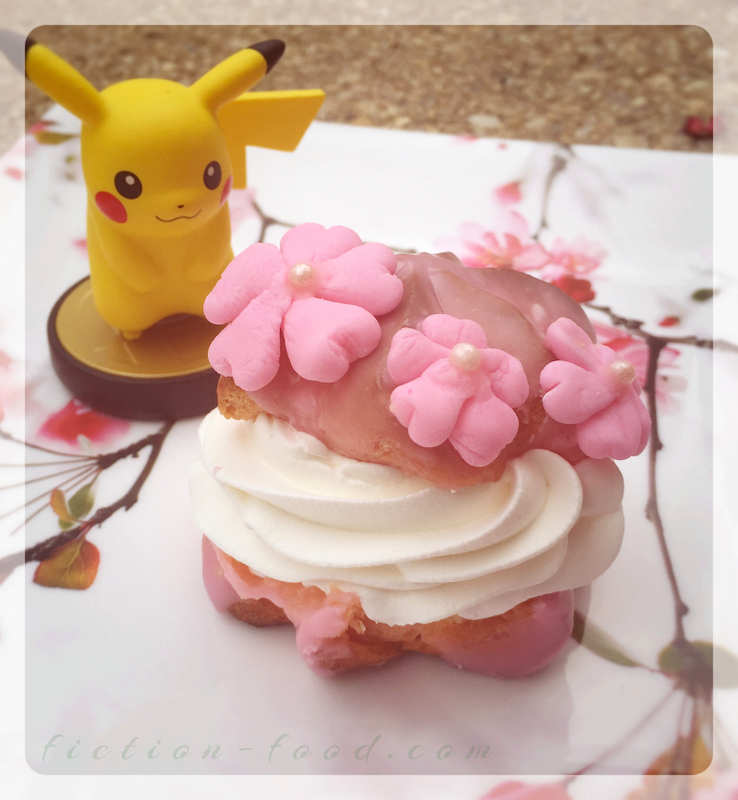 And because we are now in Spring and it's time for the Japanese Cherry Blossom Festival, I decided to make Supreme Spring Poké Puffs to celebrate! B, Smalls, and I are going to the Sakura Matsuri Street Festival in DC on the 11th, and I'm really looking forward to it so I wanted to do this recipe now, in anticipation of our fun day trip. Note: The recipe below has several different parts to it, but if you're short on time or just don't want to make such a huge mess in the kitchen you can use cool whip for the filling and store-bought pink frosting for the icing instead of making the items from scratch. You'll need to heat the frosting up to make it pourable. If you have the time and energy though, I recommend making your own because it tastes so much better! 1. Filling: Pour the pudding mix into a large mixing bowl & add in the milk & heavy cream. Mix in medium-high speed until thick & creamy & fully combined. Scoop into a container with a lid, close it, & refrigerate it until ready to use. Note: Instead of making this pudding filling, you could also make your own whipped cream using heavy cream & powdered sugar (recipe here). The pudding filling is sturdier, so if you decide on whipped cream filling you might want to add in a melted marshmallow or a little bit of Whip-it stabilizer. 2. Puffs: In a medium bowl, whisk together the flour & salt. In a medium to large pot bring the butter & water (or water + cherry juice) to a boil. Turn the heat off & add the flour, stirring with a wooden spoon, until you've got a smooth, thick dough. Scoop the dough into a large mixing bowl & mix on low for a minute. Beat the eggs with a whisk or fork & then pour them into the bowl with the dough & immediately mix on medium-low speed until the eggs are fully incorporated & the dough is smooth (not slimy!). Scoop 1/2 of the dough into a piping with the extra large star tip & hold the bag vertically over a parchment paper-line tray & pipe in an upward motion a dough star about 2" in diameter. Pipe the dough about 1 1/2"-2" apart & then gently press their top points down with a wet finger. Bake at 450ºF for 10 minutes & then turn the heat down to 350ºF & bake for another 25 minutes. Do NOT open the oven door at any time during baking. Remove the puffs from the oven & quickly transfer them, on the parchment, onto the wire cooling rack & cut each one in half. Let these cool completely while you bake the second batch, remembering to turn the oven heat back up to 450ºF. 3. 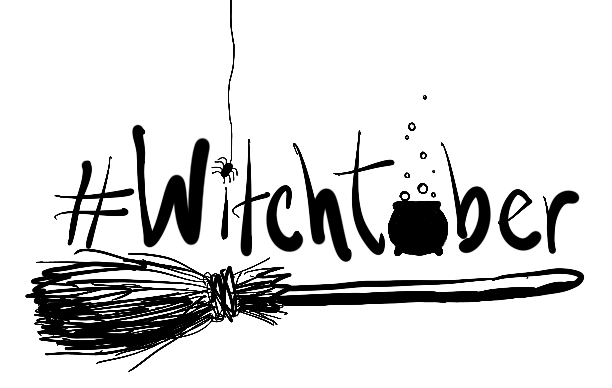 Icing: Melt the white chocolate either in the microwave at 30 second intervals or on the stove in a double boiler. In a large bowl stir together the powdered sugar, corn syrup, & water until smooth. Pour in the melted chocolate & stir again until fully incorporated. Add in a drop of pink gel coloring plus the drop of optional cherry flavoring & stir again to get a pretty, light pink icing (add more coloring if needed). Place a large tray under the wire cooling rack & place all of the puffs, with their tops on, on the rack. Spoon the icing generously over each puff until they are all covered. If the icing is too thick, simply zap it in the microwave for about 10-15 seconds, and you can scoop the icing off of the tray & continue to use it. Let the coated puffs sit on the counter while you work on the next step. 4. Blossoms: Break off small pieces of fondant & fashion them into little tear drop shapes, five per flower. Each puff needs 1 medium flower & 2 small ones. You can held the petals stick together with a little bit of water or with tiny dabs of extra icing. Using a toothpick or a clean fingernail, press in each petal end so it kind of looks like a heart. Place a tiny bit of icing in the center of each flower & gently press on a pink dragée/sprinkle. Let these blossoms sit until ready to decorate. Note: My blossoms came out a little thick. Next time I'll flatten them more & make them several hours or the night before so they can harden. 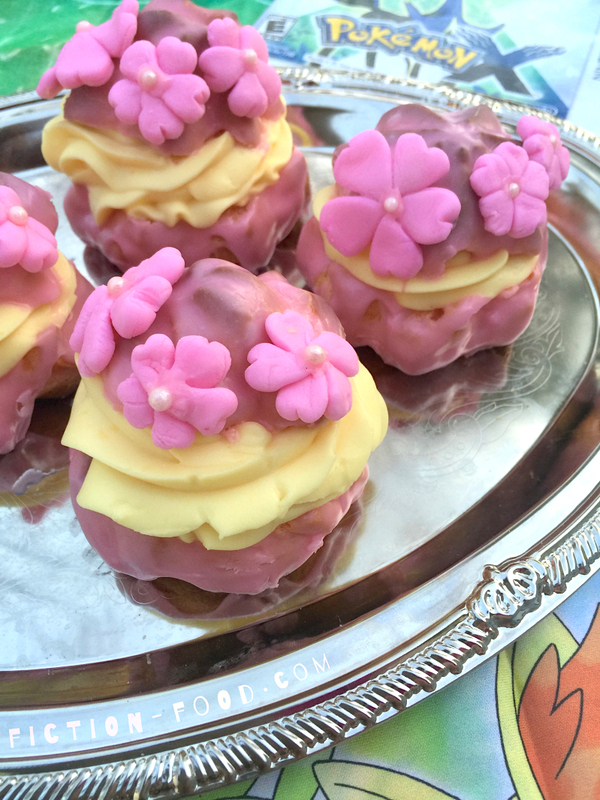 To make them even nicer looking, get 2 small cherry blossom (5-petal) cutters (1 smaller than the other) & roll your fondant out flat, like 1/16", cut, & place the cut-outs in a cake pop baking tray so they dry curved! 5. Just before serving, take the filling out of the fridge & scoop about half of it into a piping bag with the other large star tip attached. One at a time, carefully remove the tops of the puffs & pipe in a generous amount of filling, scooping more cream into the piping bag when needed. Replace the puff tops & then gently press on the fondant blossoms, 1 medium & 2 small for each puff. You make such cute food! I can't play Pokemon Amie without getting hungry. These would be super cute to make for a party. Thank you! I know, the in game poke puffs look so tasty! I'm totally going to make more. 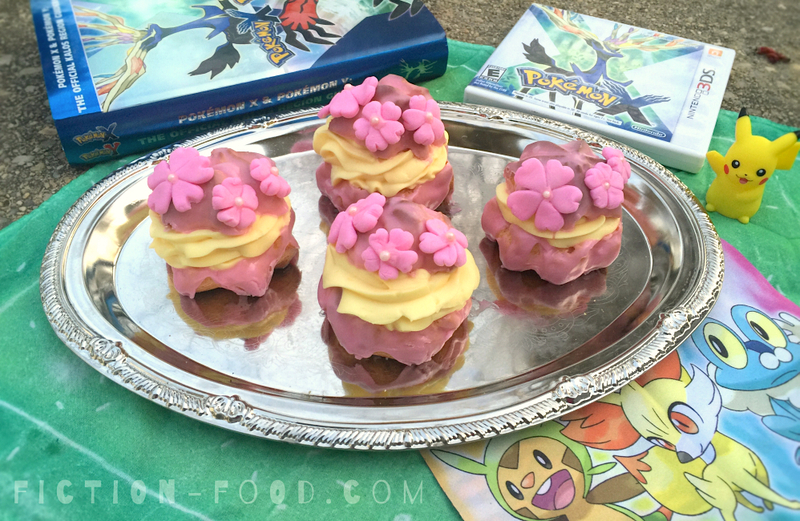 And this recipe makes about a dozen, so yes, perfect for a little pokeparty! 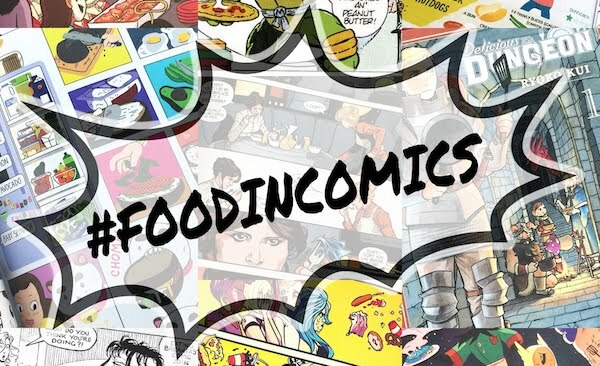 One of the great things about creating foods from fiction is that there can be many interpretations. I haven't found any definitive statement about poke puffs being macarons or being specifically based on them—for myself I don't think they look the same—but some fans do see them that way. Some people may make the macaron connection because the pokemon Vistini and Chespin are in love with macarons in the animations, but in those instances the macarons are simply macarons, not poke puffs. 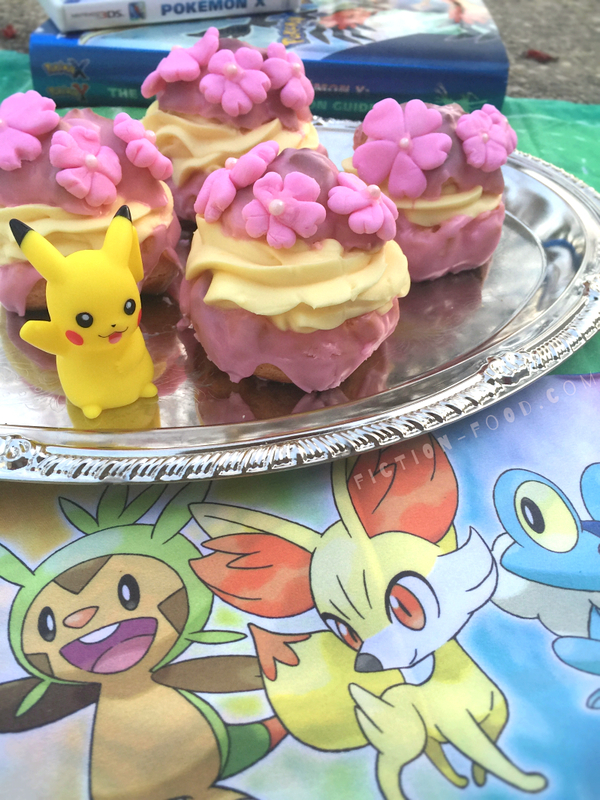 Many fans see poke puffs as cupcakes, such as the creator of the blog The Cake is Not a Lie, who actually created a whole post about poke puffs not being macarons (http://cakeisnotalie.net/2014/03/pokepuffs-are-not-macarons/). I would be interested to read an official interview or article in which the creators of Pokemon mention their inspiration for poke puffs (because I love the topic of food in fiction) but to my knowledge there isn't such an interview and we are left to interpretation and imagination. My next poke puff installment is even going to be different than this one. It's all just fun experimentation and creation! Very good blog post. I absolutely love this site. Continue the good work, dig this!